Dung & Dunger is the realized dream taking what seems would be the impossible task of turning dung into serious and respectable art. 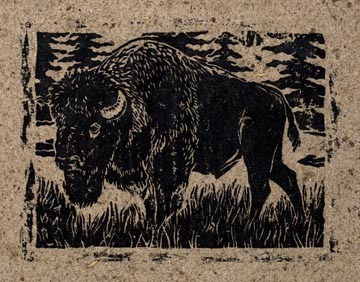 While most recognized wildlife artists follow the worn and beaten path of conservative realism and decorative predictability, Victor Bruha and Dan Hidalgo have created beautiful and original works of art using traditional and ancient methods with the world's first Bison Dung Papers. Tatanka (Tuh-tahn-ka) is a Native American word for "bull bison", or scientifically, the American Bison (bison bison). In the Native American culture, the bison is revered as a powerful, spiritual deity, which had once numbered in the millions throughout North America. Although they were in the midst of plenty, Native Americans were frugal with this important resource. The bison provided not only much needed food and clothing, but a variety of items and tools made by utilizing every last bit of the animal, including the dung in dried form! Bison chips (dried dung), made for an excellent campfire fuel. An even lesser known fact is that the dung was also used as a type of baby powder to help keep infants dry and comfortable. Now, Idaho artists, Victor Bruha and Daniel Hidalgo have found yet another clever use for the chips...bison dung hand-made paper! Having spent much of their childhood in and around the Greater Yellowstone region, the two formed a deep appreciation and understanding of what makes this landscape so special and developed a great admiration of these magnificent animals. 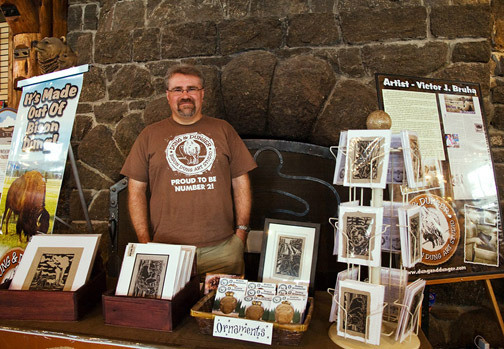 Combining their love for the wilderness and natural creativity, they nurtured the somewhat unorthodox idea of converting bison dung into a usable art paper. In the spirit of the Native American culture and with a deep respect for the great North American wilderness, their works of art are a creation inspired by a love for the wildness that is the Greater Yellowstone ecosystem. It is a precious place where the last and largest herds of wild American Bison still roam free. 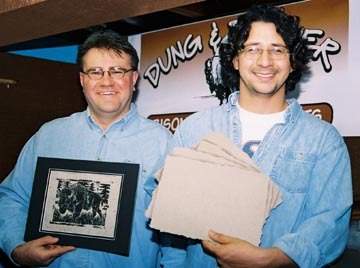 Dung Paper creators Victor Bruha (left) and Daniel Hidalgo (right). Printed in the fall of 2004, the first print ever to be created on hand-made Bison Dung Paper. Order an original print of "Bull Bison" on Bison Dung Paper today!